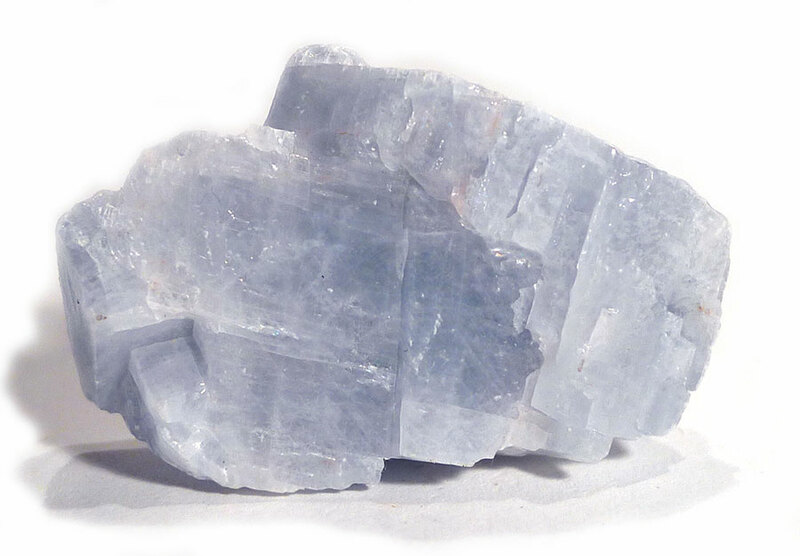 Calcite supports and increases development on both a physical and spiritual level. It is one of the best clearing/cleansing minerals, fizzing away that which is not wanted/needed, and helping to clear on every level, thereby improving clarity of thought and purpose, and detoxifying the body. It also opens and strengthens the chakras, and encourages stability and self-trust, while helping us to transform our ideas into actions. Physically, calcite is an aid to the healing and strengthening of bones and teeth, as well as the strengthening of cell walls, and can also support blood-clotting. 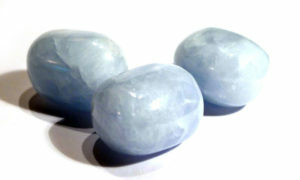 Blue calcite aligns with the Throat Chakra, and therefore aids communication, particularly on an Angelic and spiritual level. 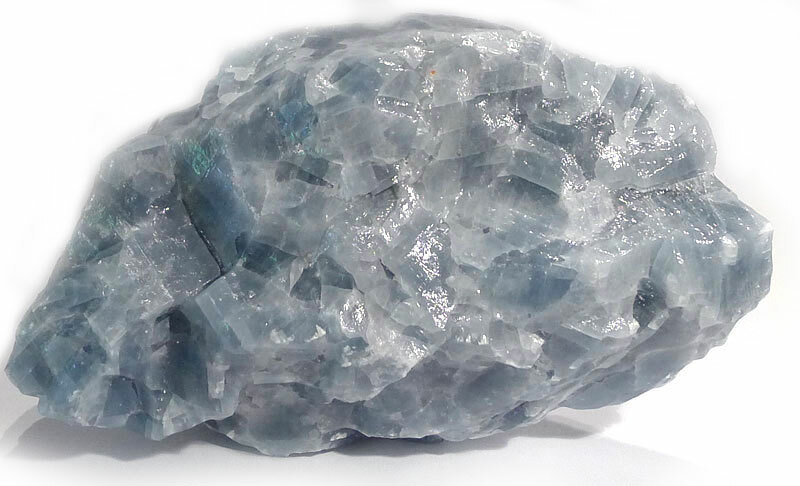 This, combined with calcite’s general quality of supporting development, makes blue calcite beneficial in strengthening and advancing psychic and spiritual development. It is also profoundly calming. Calcite is the most common form of calcium carbonate (CaCO3) in the Earth’s crust. It is found in many different geological environments, including in sediments, chalk, and organically, in seashells (along with aragonite). Calcite usually forms massively, occurring as marble and limestone, but it also displays a wide variety of beautiful crystal formations with a range of colours. Crystals are rhombohedral or scalenohedral, and it readily cleaves into rhombohedra. In addition, it forms as fibres, nodules and stalactites. Optical calcite provides a perfect example of double refraction. In other words, when light passes through the crystal, half of it passes straight through, while the other half is bent (in the same way light bends when passing through still water, so a straight stick appears to bend as it enters the water). As a result, calcite creates two images when an object or text is viewed through it. Calcite fluoresces pink under long wave ultraviolet light, and blue under short wave. In spite of its range of colour and habit, it is easily recognised by its softness, strong perfect cleavage, and reactivity with even mild acids – a drop of vinegar will create a ‘fizz’, dissolving the calcite it touches (this is an easy way to identify limestone as well). Coloured calcites from Mexico are usually acid-dipped to preserve their integrity – hence the smooth, waxy feel of the surface. As harsh as this sounds, it seems to have no more impact on their healing qualities than carving and shaping. In an interesting aside, trilobites (one of the earliest known groups of arthropods, which exist in the fossil record from the Early Cambrian period, 521 million years ago, until they became extinct 270 million years later), have complex compound eyes with lenses of clear calcite. Calcite was named as a mineral by Gaius Plinius Secundus (Pliny the Elder) in 79 AD from calx, the Latin for lime. Burning lime (as in limestone – a variety of calcite) and mixing the resulting powder with sand and water creates cement, believed to have first been discovered by the Macedonians, but put to use on an industrial scale by the Romans. In the form of marble, calcite has been use a building and carving material for thousands of years. Virtually all Ancient Egyptian so-called ‘alabaster’ carvings are actually made of yellow calcite – this includes the Sphinx (alabaster is a variety of gypsum). In spite of its history, there are few early references to the medicinal use of calcite, possibly because it wasn’t considered a gemstone. Hildegard von Bingen (12th century) describes a calcite poultice to kill worms which eat the body (the type or worm isn’t clear, but from the description she is most likely referring to maggots in a wound, and not intestinal parasites). Norse legends speak of a “sunstone” which was held up to the sky in order to see the sun on an overcast day, allowing the Vikings to navigate in open sea. Archaeologists now believe this was clear optical calcite, as the double refraction does help to locate the sun visually through clouds. The most notable deposit of optical calcite was at Eskifjord, Iceland – hence the nickname “Iceland spar”.